This five-page introduction gives the essentials of what the Ancient Penwith site is all about. Suitable if you don't have much time and you just want the gist of it. 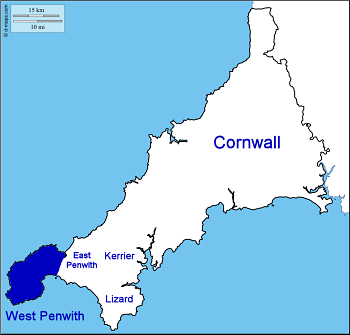 West Penwith, the ancient Belerion, is rich in prehistoric sites - a good place to research them. A concise area and distinct in size and boundaries, it is surrounded by sea cliffs on three sides and a distinct boundary on the landward side. This boundary is formed by St Michael's Mount and Trencrom Hill, two neolithic tor enclosures going back around 5,700 years. 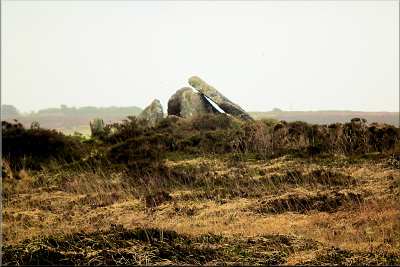 Many people who live in Penwith or visit here are interested in prehistory, so there has been a lot of thinking about ancient remains that is relevant not only to this area but also to other megalithic regions in Britain, Ireland and along the west coast of Europe. Penwith has a rather special magic atmosphere today - you can feel it - and the landscapes, cliffscapes and seascapes are uplifting and spectacular. At the far southwestern end of Britain and on Europe's Atlantic edge, it has one of the highest densities of ancient sites in Europe. Strange, for such a small area. But then, long-distance travel took place by boat, and Penwith was then a focal hub for traffic across the megalithic world. Prehistoric Europe's megalithic culture stretched along the Atlantic seaboard from today's Portugal and Galicia in NW Spain to Brittany, Ireland, Britain and southern Scandinavia. It also affected parts of France, Germany and the Low Countries, and Sardinia and Malta. 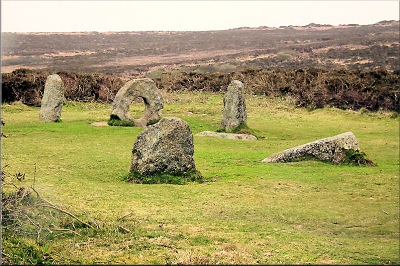 Its roots lie in the mesolithic culture of the 5000s and 4000s BCE, but in Cornwall things hotted up with the building of the first megaliths around 3700 BCE - neolithic tor enclosures, quoits and placed and propped stones. After a lull around 3200-2900 BCE, caused probably by a climatic downturn, a new phase started around 2500-2300 in the transition from the late neolithic to the bronze age. The bronze age megalithic phase lasted a millennium, peaking around 2200-1800, eventually to decline by 1500, and finally ending around 1200 (another climatic downturn). After this no further megalithic sites of this kind were built and these, to the people of the time, ancient temples had by then moved from the centre to the periphery of their lives. The megalithic bronze age period, from 2500ish to 1500ish, saw the building of standing stones, stone circles, enclosures, barrows and tumuli in Penwith. The bronze age zenith in the centuries around 2000 made megalithic Britain a noteworthy, even influential civilisation amongst those in existence at the time across the world in Crete, Egypt, Mesopotamia, Harappa and North China. Its tin, copper and gold were traded as far as Syria. The knowledge and principles established in the megalithic era were known and emulated later in the iron age (roughly 600 BCE to around CE 200), the time of the druids, whose roots lay in the bronze age. This knowledge was later incorporated into the building of medieval churches up to around the 1400s, when it went into final decline, surviving only amongst esotericists and freemasons in the centuries that followed. 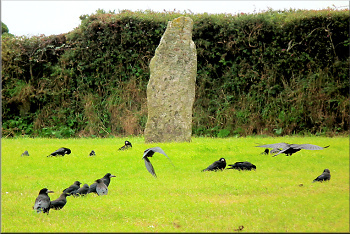 In its heyday, West Penwith had around ten stone circles - the Merry Maidens and Tregeseal had two or three each, and Mên an Tol was originally a stone circle. Perhaps half of its menhirs have been destroyed by farmers, landowners and miners, and half of its quoits (dolmens) are nowadays in a poor state - they might have been decommissioned in ancient times. Many cairns and barrows have melted into the landscape or they have been removed (their soil being quite fertile). The cliff castles, hilltop enclosures and camps are all there , protected by the wildness of their locations. 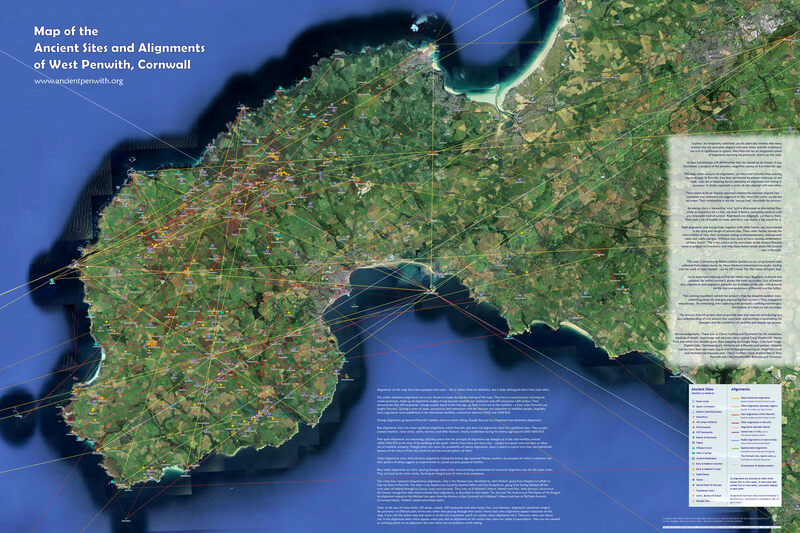 West Penwith has around 500 ancient sites big and small, and many are intact - a full list of sites can be downloaded here and you can download a map here or see it in greater detail on Google Maps. Many of Penwith's ancient sites are well worth a visit. If you like walking, you can cover a number of them in one walking trip, and if you're not so good at walking, some sites can be visited with only a little legwork, but wheelchair access is difficult since there are stiles to climb, rough ground to cross and muddy patches in wet weather. Why are Ancient Sites Important? One reason why many people like visiting ancient sites is that they affect our feelings and mood. You come away feeling better, your worries have evaporated, your view of life has changed, a smile comes to your face and you feel more whole. Have you experienced that? Something about them is special, different in psycho-spiritual tone from ordinary beautiful places out in nature. This is because, when you visit them, you are entering an energy-field. We don't fully understand how this works but we do have clues. Containing and enhancing energy-fields is a key reason why ancient sites exist and are placed where they are. This is not easy to measure by scientific means nor to understand rationally and it confronts our modern mindset. So it is mostly disregarded. This website proposes that the key to ancient sites lies in understanding subtle energies. The ancients had a shamanistic perception that, for human life to succeed, we needed to harmonise with the subtle energies, periodicities and laws of heavens and earth. This was a practical, economic, ecological and psychosocial issue for them - not just a religious belief - that is becoming increasingly relevant today. After all, our world is in trouble environmentally, climatically, economically, socially, technologically and... spiritually.